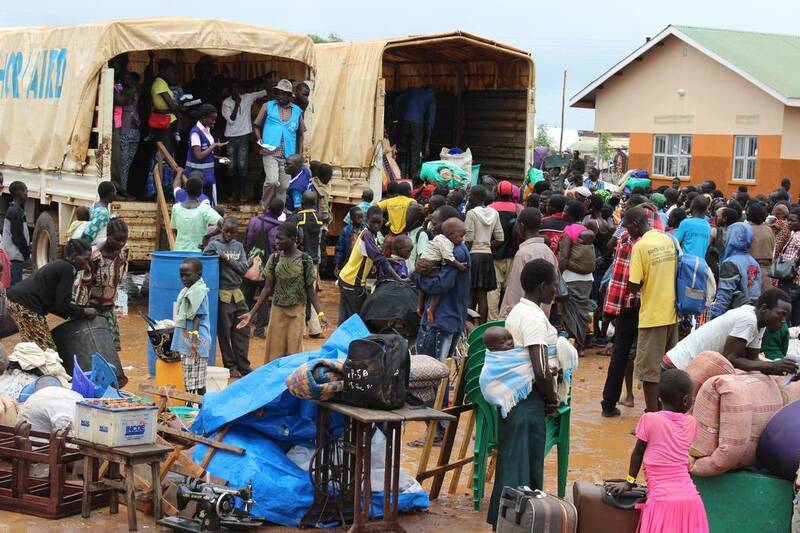 (LWI) – Following violent clashes in South Sudan, thousands of South Sudanese have now arrived in Uganda to seek refuge in the neighboring country. Most are entering through Elegu collection center at the border between South Sudan and Uganda, which has been managed by The Lutheran World Federation (LWF) since December 2013. “It took more than five hours of non-stop streaming in of the new arrivals through the gate of the collection center. We did a quick count at the gate for an hour and on average, 41 people were entering in a minute,” LWF staff Betty Lamunu reports. From 17-21 July, LWF received more than 12,000 people, with a peak of more than 7,000 people on 21 July. The team expects those numbers to rise in the coming days. According to LWF staff, refugees cite the fragile security situation, fighting, torture, forced recruitment of youth, looting and hunger as reasons for fleeing to Uganda. The refugee movement is a result of violent clashes that broke out in the South Sudanese capital of Juba. Hundreds of people, mostly soldiers, have been reportedly killed in the fighting between rival armed groups, raising fears of a slide back into all-out conflict. The refugees who arrive here confirm our suspicions that a major influx to Uganda will take place over the coming weeks. There is a critical need to prioritize emergency response and life-saving activities in light of the current rapid deterioration of the situation. On 4 July a peace agreement between South Sudanese President Salva Kiir and his vice president Riek Machar collapsed. The security situation has remained critical since then. Last week, LWF staff were sent home or evacuated. The LWF Juba office has been operating from Nairobi, Kenya, since. Ugandan military convoys crossed into South Sudan on 14 July to evacuate its citizens from Juba. The convoy of around 50 trucks triggered the movement of refugees now being received. 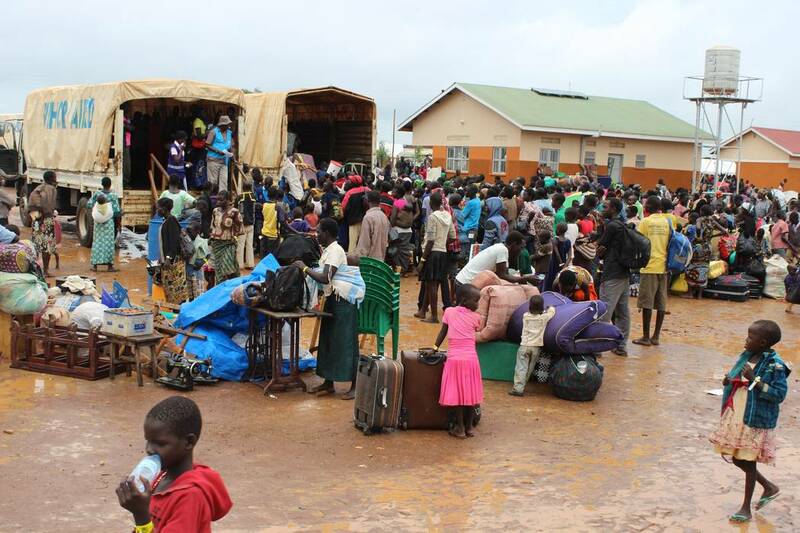 The UN refugee agency UNHCR expects more people to flee to Uganda, especially now that the 200km Juba-Nimule road, linking the South Sudan capital to Uganda, has been cleared of checkpoints. As a result, more people are now coming by truck. The new arrivals are mostly fleeing Eastern Equatoria state, with a smaller number arriving from Juba. They report that the security situation remains volatile and fighting could return at any time. Adjumani in north Uganda has, once again, become the main recipient of South Sudanese refugees. LWF continues registration of new arrivals at Elegu Border Point and has constructed temporary shelters to accommodate new arrivals awaiting registration and transportation. LWF also maintains hygiene at the collection center and provides soap and sanitary materials to all households and to women, and dignity kits for women and girls. Special attention is given to people with special needs including unaccompanied minors, separated children, people with disabilities and victims of sexual and gender based violence. A psychosocial support desk has been created at Elegu to handle severe psychological cases. According to LWF staff, the refugees are desperate, traumatized and famished after walking for days without food. Lamunu tells the story of a 12-year old girl who was in boarding school when the fighting started and came home to find both her parents burnt in their house. She has also met children who were brought by neighbors and who do not know if their parents are still alive. “They may be too young to understand what is happening but their souls tell them that something is gravely wrong. We will have to scale up child protection programming or sustainable peace and security in the future,” she says. As of 30 June, 228,250 South Sudanese refugees were hosted in Uganda with nearly 137,930 residing in Adjumani Refugee Settlement where LWF provides water, sanitation, protection and other lifesaving interventions to nearly 60 percent of the refugee population. A new site has been identified with a capacity for 22,000 refugees. Currently hosting 10,000 people, it is expected to be full by the end of this week. The massive influx has created significant gaps in core areas of water, sanitation and hygiene, shelter, non-food relief goods and protection. “It will be critical to address the urgent needs of new arrivals, whilst continuing to stabilize the situation of the substantial number of South Sudanese refugees who are already living in Adjumani,” LWF country representative Jesse Kamstra says. The LWF country program in Kenya has also prepared for rising numbers of refugees. LWF manages the reception center at the Kakuma refugee camp, which hosts mostly refugees from South Sudan, and the transit center at the border between Kenya and South Sudan. As the border to Kenya is further from Juba, LWF staff however expect refugees to arrive much later. 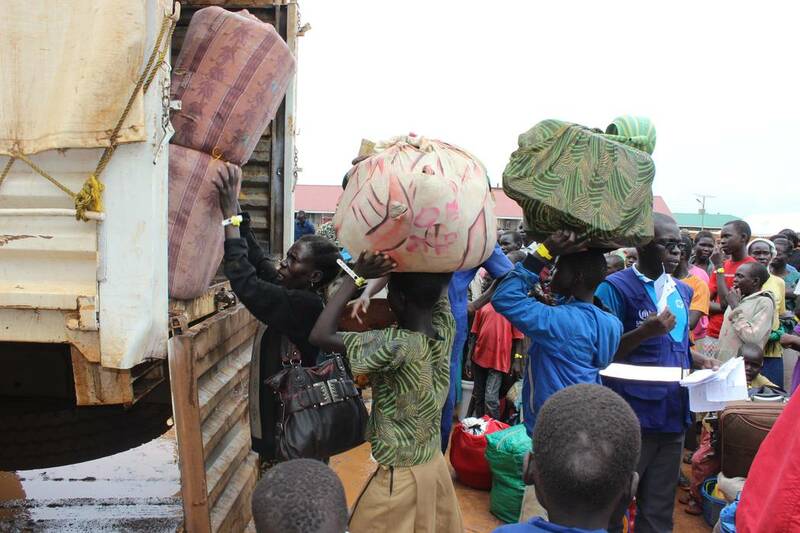 Refugees load belongings onto the back of a truck, Elegu collection center, at the South Sudan-Uganda border. Refugees contend with rain and mud as they board a truck at the Elegu collection center. The LWF has received more than 12,000 refugees this week alone. 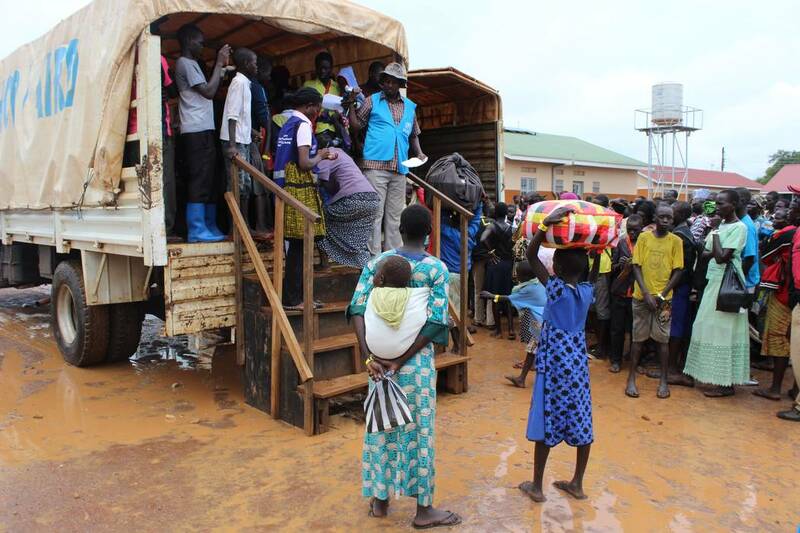 Refugees of conflict in South Sudan wait to board trucks at the Elegu collection center. 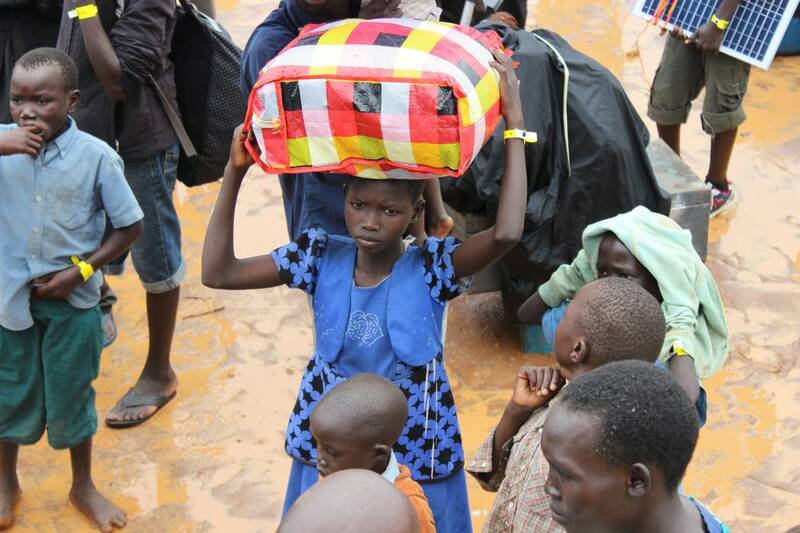 Refugees with an assortment of belongings at the Elegu collection center.